There were enough elementary schools in Sutton to accommodate all the children in 1900, but only a privileged few went on to secondary education. For boys this meant Bishop Vesey’s Grammar School, with a roll of nearly 200 pupils. The boarding schools at Ashfurlong Hall and New Hall which had flourished in 1880 under their headmasters Matthew Wilson and A. Hastings-Jones, each with about thirty boarders, had closed by 1900, but Bishop Vesey’s was still taking boarders. In 1901 there were fourteen pupils living there, as well as Albert Smith the headmaster with his family and three resident assistant masters. Boarders at the grammar school, aged between 10 and 16, were not usually native to Sutton, but from middle-class families in the surrounding area - parents included an Atherstone hat maker, a Walsall grocer, and an Erdington brassfounder. There were three boys from Ireland and two from Manchester, at least one was from a broken home, and there were three sets of brothers. However, boarders remained limited in number; the extensive new buildings at the school in 1887 had not increased the number of boarders, nor was the big house, “The Firs”, built in the 1870s, next to the school, used for boarders. It was on the corner of Boswell Road, which would have been convenient for boarders, but this was a private house, nothing to do with the school, where the Chavasse family lived. The site of The Firs is now a grassy mound within the school grounds. Another 1870s private house (which is still there) occupied the opposite corner of Boswell Road, “Wren’s Court”, home of Francis Fletcher, director of a druggists firm. The next house, three doors up from Bishop Vesey’s, was Allerton College. This was a school for girls, with fifteen girls staying there, aged between ten and eighteen, as well as many day girls. The boarders had similar backgrounds to those of the boys at the grammar school - Ethel Wilson was the sister of the hat-makers’ son - none of them were natives of Sutton, one was born in Ireland and one at Mitcham in Surrey. Most of the Sutton girls who went on to secondary education in 1900 were day girls at private schools - the Girls Grammar School in Sutton did not open until 1929. Allerton College (long since demolished) was the largest of these private schools, started in Mill Street in about 1870 by Sarah and Alice Brentnall. 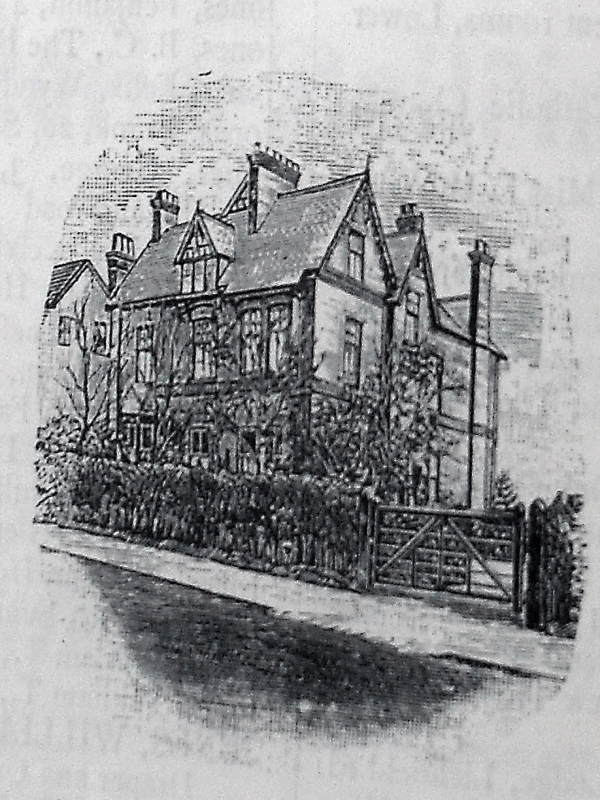 The school moved to new premises in Lichfield Road in the 1870s; the building may have been a purpose-designed school, but it had the appearance of a typical oversized Victorian house, as the illustration shows. The school had a Principal, Alice Brentnall, aged 51, Lucie Earl, 41, was headmistress, and three teachers also lived in, Isabella Dronsfield, aged 25, originally from Wick in Scotland and 20-year old Helen Edwards from Chesterfield. The third teacher, also aged 20, added class to the school, Jacobina Utheman from Germany. Five servants completed the household. The college had grounds of nearly two acres, and tennis, hockey and its gymnasium were prominently advertised. Allerton College, Lichfield Road, from the illustration on the 1900 advertisement.